I love love love vegetable gardening and it is by far my favorite thing to grow in the garden. As I travel around the US I am always stopping when I see veggie gardens in urban front yards or acre after acre in rural areas. I love watching the entire plant cycle from seed to harvest and I got in the habit that I only would plant what I could eat in my garden. This was a great way to bring fresh vegetables into my home and share my bounty with my neighbors. I get asked All.The.Time. what I recommend for people to grow in their garden. I’m a bit biased, but I truly love to grow organic, heirloom veggies. I love that one plant can produce different shapes and sizes and the tastes are just incredible. There is nothing quite like biting into a ripe tomato that you just plucked from the garden – even when the tomato plant is in your front flower bed. Cutting lettuce, kale, or even baby broccoli that I planted for shrubs was always great for that night’s dinner salad. Growing vegetables was a source of relaxation for me. Here are my 10 Most Popular Heirloom Veggies to Grow – and I have tried my hand at growing each and every one of them. Tomatoes are my favorite thing to grow and are also the number one grown vegetable worldwide in both backyard and container gardens. There are hundreds of varieties to choose from including yellow or red pear tomatoes that are excellent in salads to Better Boy, and my favorite, large Heirloom tomatoes like Brandywine. If you love to make your own homemade sauces and salsas, don’t forget to plant Roma Tomatoes. Cucumbers are an easy veggie to grow and one plant produces tons of cucumbers! This is a heat-loving plant and can be sown directly into the garden after all dangers of frost have past or you can plant transplants too. These are fun plants to grow from seed as they grow to fast – perfect to show the kids how to garden! Pumpkins are super popular to grow in the middle of the summer and are typically planted around the 4th of July. 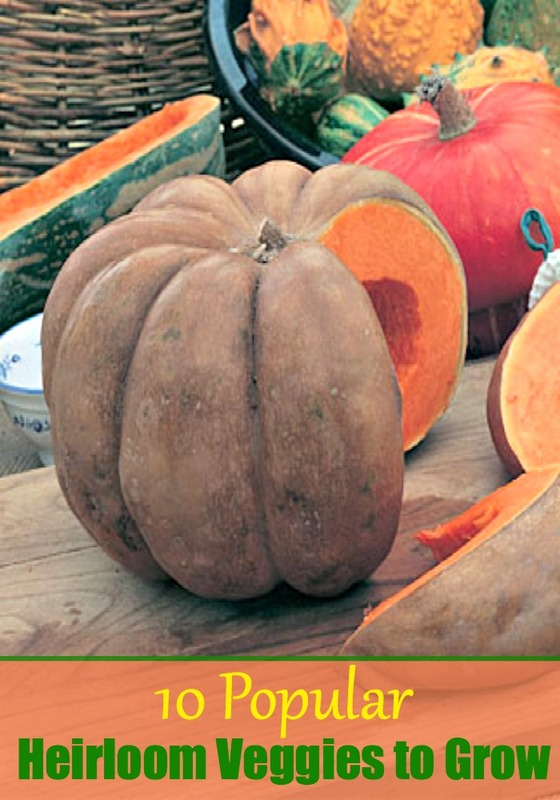 All squash plants prefer the heat of summer and my favorites to grow include the small sugar pumpkins, Jack O’ Lanterns, and I have even tried Big Max. Pumpkins take a lot of space and water and send out a vines that take up a lot of space. I tried them on my apartment balcony once – that was a sight! Make sure to give them a lot of nutrients as the pumpkins are growing. Green Beans love warmer weather and pole beans grow beautifully up a trellis and bush beans make a great shrub plant. They are often planted next to corn so the corn is the green beans’ trellis. Green beans are a great vegetable to can and also to freeze when picked fresh. There is nothing quite like fresh green beans from the garden. This year, try planting the purple ones! Peas prefer to grow in cooler weather and can be sowed in early spring or summer. I always planted them in my late fall garden and they grew nicely until late spring in my garden that was Zone 9. Now that I am in Zone 4, I will start them in late May. Plant peas next to a fence or around a trellis as they need the support. Peas have beautiful flowers that attract butterflies and bees to the garden before they set out their pea pods. Broccoli is a very popular cool season crop and needs to be spaced at least 12” from other plants as they can grow a large crown. I used broccoli as part of my hedges and the neighbors got a kick watching them grow too. You can harvest the florets as they shoot up or wait until the broccoli has formed the crown and then cut that off. If you harvest the florets, it will continue to send them up throughout its growing season. Carrots grow very well in the cool season and are super easy as you can just toss the seeds in an area, and then once the plants start to grow, thin out so that they are 2” apart. Harvest the sweet and crunchy root vegetable when the carrot’s shoulders push up out of the ground. Spinach is great to grow year round in most areas of the country, even though they prefer it a little cooler. Sprinkle seeds on an area in your garden and in two weeks harvest your baby spinach. Sow new seeds every week so you always have new leaves to harvest. Lettuce is popular to grow because of just how easy it is. Growing leaf lettuce is down similarly to both spinach and kale. Both leaf and head lettuces grow best in the cool season, but you can grow loose leaf year round. Sow different types of loose leaf lettuce seeds together to create your own spring mix. Kale has quickly become one of the most popular vegetables to grow because it can be pricey in the grocery store. It is my favorite vegetable to grow right now – and eat! It is also a cool season crop that grows well with spinach and loose leaf lettuces. As it grows, harvest the outer leaves to enjoy baby kale in your salad all week long. In warmer areas, water it well and give it partial shade to get it to grow year round. Don’t forget to check out this post where I list out some much needed tools to start a garden: Ready to Start a Garden? I’m always super enthused about my garden till about July 4. Then the heat, humidity and weeds always have me rethinking my sanity. I have kept it simple with peppers and tomatoes. But fruit trees and herb garden are rock-in. This is a great list of things I need to grow, I just started an herb garden (basil, sage, thyme, rosemary, cilantro & oregano) it’s doing really well, so I’m more confident to try these veggies you suggested, I’m super excited we are going to save money and be able to eat from farm to table, so cool. Thank you for sharing. I like growing tomatoes and eggplant. I haven’t grown green beans but I imagine they are similar to growing lima beans on a trellis which I’ve done in the past. Some good looking vegetables there.